The audience search filters are broken out into five buckets; Most Common Filters, Company Lists, Financials, Technographics and More Contact Details. How you decide to filter leads is going to affect the overall reach of the audience you're building. Going too narrow with too many filters might mean you can't get as many leads as you'd like. Creating too broad of an audience might mean your message doesn't resonate with the leads, and your ROI suffers. It's best to intimately know your target audience, play around with the filters, and run some tests to see what works best for you. When choosing filters for your audience, remember that you are answering the question "Who are you targeting?" Filters can define who to target and also who to avoid. For instance, you may want to target employees in retail companies except for managers, so you would filter first by Company - Industry "Retail" and then by Contact - Job Title "Manager." You would leave the Company - Industry "Retail" filter set to "Include" and change the Contact - Job Title "Manager" to "Exclude." You'll also notice that when you type in "Manager" into the Job Title bar you'll get a suggestions such as "Mgr." as well. This is the system recommending titles that mean the same but exist in the system differently. Note: Growlabs offers similar filter suggestions based on what you've already inserted. Our database is massive and data is compiled from a variety of sources. So, sometimes labels differ internally, but our A.I. understands that they mean the same thing. Watch what happens when I filter for companies in Seattle, WA below. You'll notice that at first I can't jump straight to the city without choosing the country. When I type in "United States," it also recommends "United States of America." To target the people I want, I need to choose both. After choosing country, I can choose "Washington" for the state. When I type "Seattle," it recommends another "Seattle" as well because there are records that have a slight text difference, perhaps a space in this case, in the data. Again, I need to choose both to get the leads I want. Some filters will have a check box below them that will allow you to include or exclude similar or related results in some way. I'll go into more detail in each filter description below. Find companies based on the industry they operate in. You can include multiple industries to broaden the search. We recommend inserting a company that you'd like to engage in LinkedIn and see how they've tagged themselves. 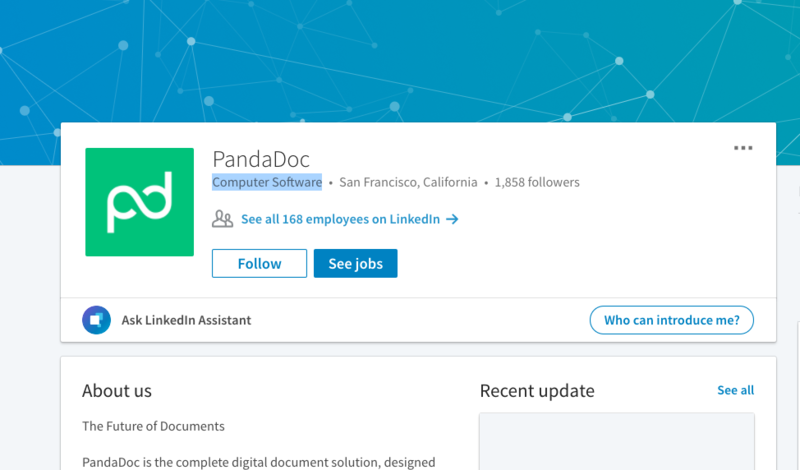 For example, if you search up PandaDoc on LinkedIn they've tagged themselves as Computer Software. Every company has a primary industry as well as sub-industries, which define the company’s specialties. For example, McDonald’s primary industry is “Restaurants”, but its sub-industries include “real estate”, “supply chain”, “franchising”, and more. An e-commerce company may have its primary industry listed as “Internet” and sub-industry listed as “E-Commerce”. You can see the industry and sub-industries by clicking “view” beside each search result. Find people based on their specific job titles. Pro tip: include as many variations of the job titles you can think of. You can also search by role (e.g. marketing, sales) in one row, and seniority (e.g. manager, VP, director) in a second row. There can be multiple title variations for any job, so searching by role and seniority in separate rows can capture more leads and job title combinations. By default, each filter you add is going to be inserted as 'Include'. You can toggle this filter to 'Exclude' if there are particular job titles, locations, industries and technologies you do not want to include in your search. Find people based on their location. You can filter by Country, and Region / City (for example, "San Francisco Bay Area"). Find companies based on the location of their headquarters. You can filter by Country, State/Province, City, and Zip/Postal Codes. The number of employees at the company. If there is an increment not listed in the company size dropdown menu that would be extremely useful for your audience searches, please contact your Customer Success Manager. Find companies based on keywords mentioned in their company descriptions or company names. This is useful for more niche types of companies. For example, "boutique hotels" or companies with "LLC" in their name. Account lists allow you to build lists of companies that match specific criteria such as Industry, Year Founded, Company Size etc. These lists can be saved to be used in Audience searches to find leads from your saved company lists. Learn how to build an account list here. Find specific companies by typing in their domains (e.g zendesk.com) or upload a CSV list to add Company Domains in bulk. Searching specific companies by domain is more accurate than searching by Company Name. Note: Double check that your domains do not include any www., http, https:// etc. Search for companies that are included in popular lists such as "Fortune 500" or "2017 Top 100 Innovative Companies" and many more. Find specific companies by typing in their exact Company Names, or upload a CSV list to add company names in bulk. Note: Company Names must have exact spelling to find a match. Find companies based on the total amount of funding they have raised to date. Note: Companies without public funding data will not be included in your results. Find companies that have recently raised money, or companies that have not raised money in a while. Find companies based on when they were founded by providing a specific year or range of years. Note: Companies without revenue data will not be included in your results. Find companies based on their type of ownership -- for example: public, private, or non-profit. Note: We may not have the above data for every company in our database. Companies without this information will not be included in your results if you use this filter. Find companies based on specific web-based technologies they use. Note: This filter will narrow your search significantly. Any companies that don't use the technology you enter will be excluded from the results. Find companies based on their website's Global and Country Alexa Traffic Rank. A site’s ranking is based on a combined measure of Unique Visitors and Page views. The higher the rank, the more popular the site. Learn more about Alexa Ranking here. Find people with specific education backgrounds. You can choose from 3 different education filters including: School, Year Graduated, and Program Name. Find people based on keywords in their online bios or descriptions, their listed skills, and their job titles.